My author debut, Robot in Love, is out right now! (Click here to buy now!) I thought I would share a little about the process. I have been drawing a robot character for a long time. 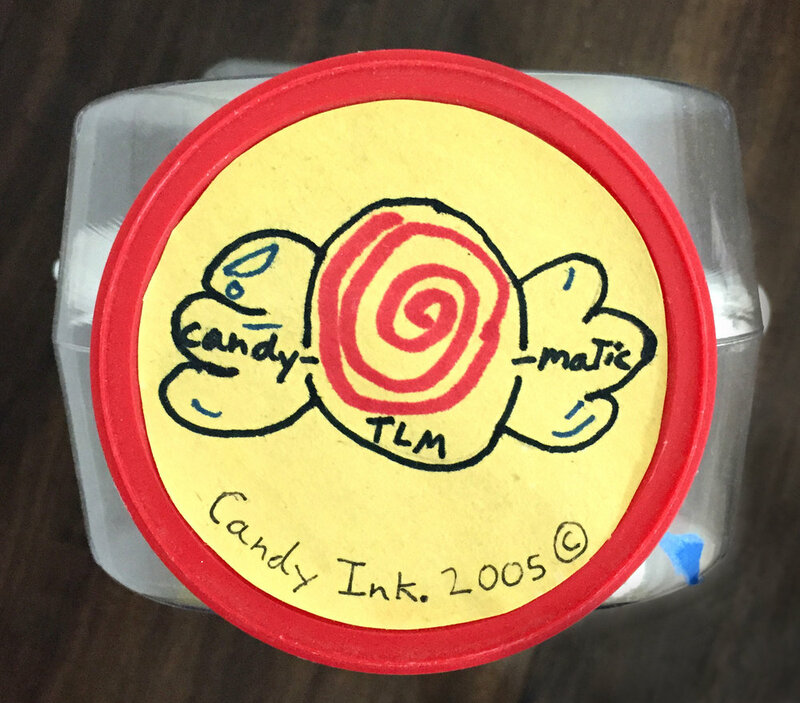 This is the earliest incarnation I could find from 2003. I was nine at the time this was made, and I was really interested in science and robots. 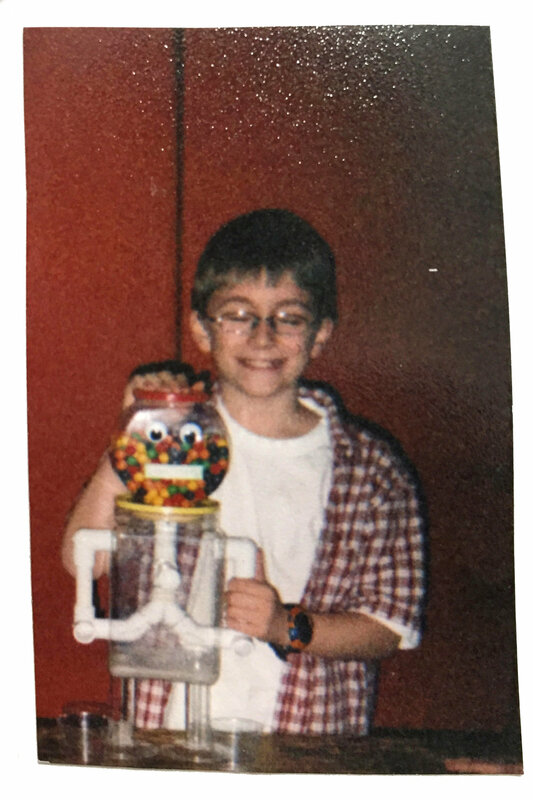 In 2005, when I was in fifth grade, we had a science fair at my school. 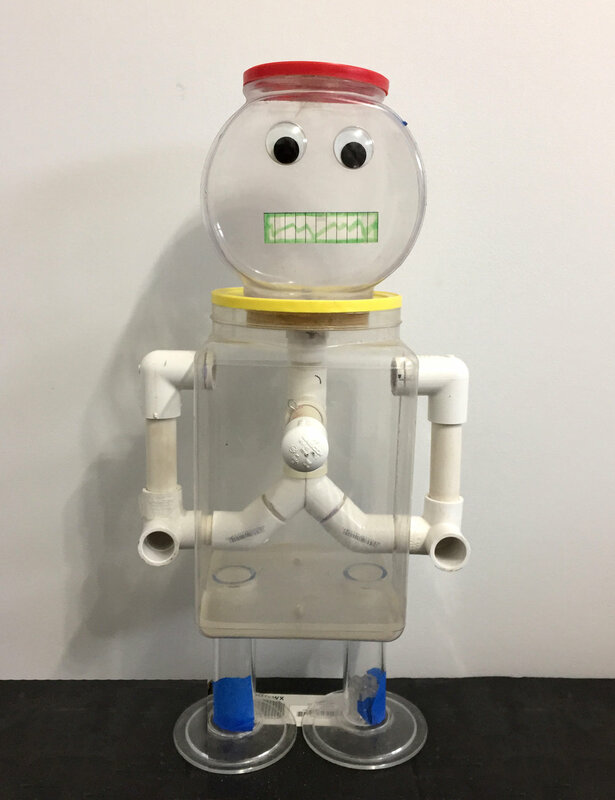 With the help of my grandpa and my dad, we made a candy-dispensing “robot.” Note how “Inc.” is misspelled on the top. 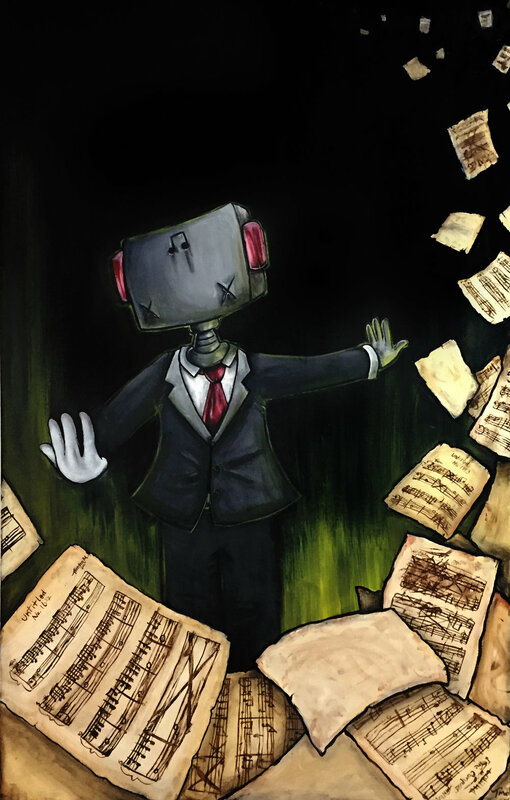 This is the first painting I did of Robot when I was in high school in 2008 – I was 14. Here is a peek into a sketchbook I kept in 2010. I have about 10 sketchbooks from my high school years and a huge box full of scraps and loose-leaf papers brimming with robot scribbles. Robot became the subject of paintings both large and small. This first one is a painting from 2010 – it’s three feet by five feet. The second, from around the same time, is on a small cloth book cover no bigger than six inches. 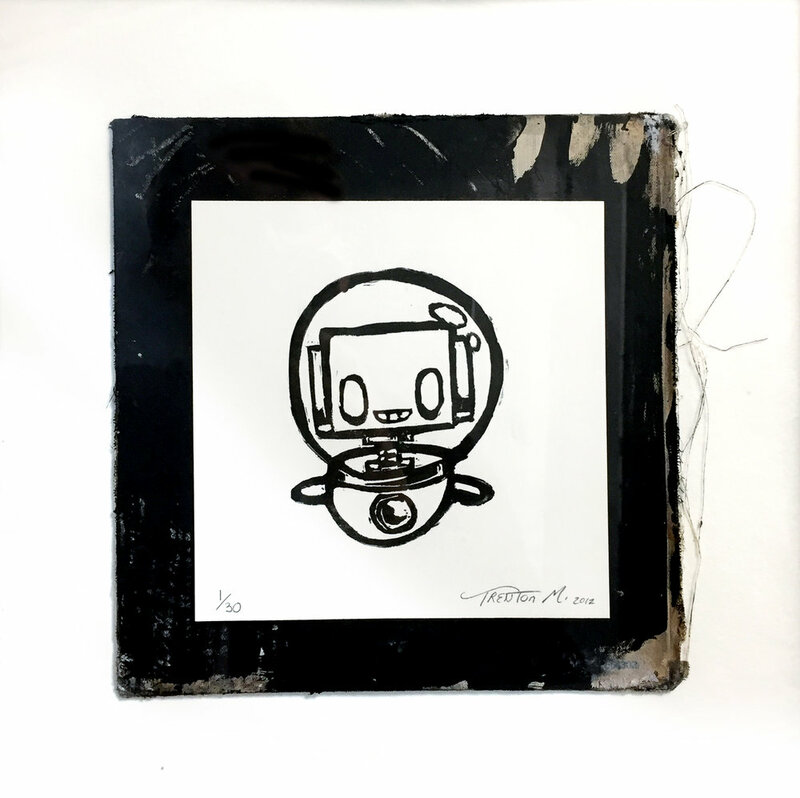 Here is a rubber stamp print from 2012, featuring Robot in a space suit. The robot character was not always bound to 2D media. He occasionally would take the form of hand painted 3D sculptures. Robots became somewhat of an obsession. It is hard to explain – I didn't love the science of robotics, but I did enjoy the idea of robots. After a while Robot seemed like an extension of myself because I had been drawing him for so many years. So I had this little guy living in my mind for several years and I had a loose story idea about him going on a date and being so nervous he fell apart. But after high school, I tried to move past Robot and expand my visual vocabulary in college. Flash forward to September 2017. I was in a meeting with my wonderful editor, Laura Godwin, reviewing the final sketches for an upcoming book I authored / illustrated called Randy: The Badly Drawn Horse (Coming in 2020 from Godwin Books). When we were done, she asked me if I had any other projects I wanted to do. 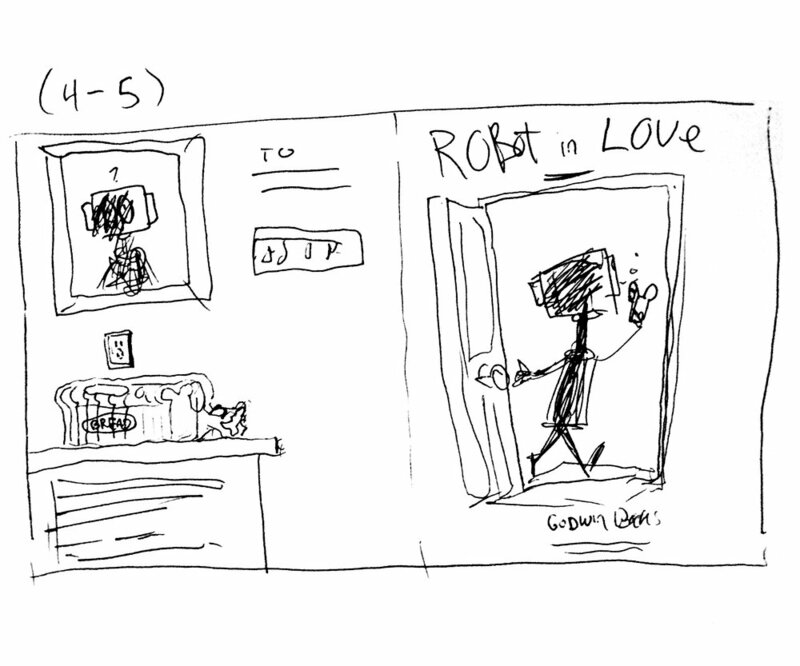 My mind immediately went to Robot and his love story, and I pitched it. She said if I could complete the entire book in two months it could be out for Valentines Day 2019. After our meeting, I went home and got straight to work writing and sketching. 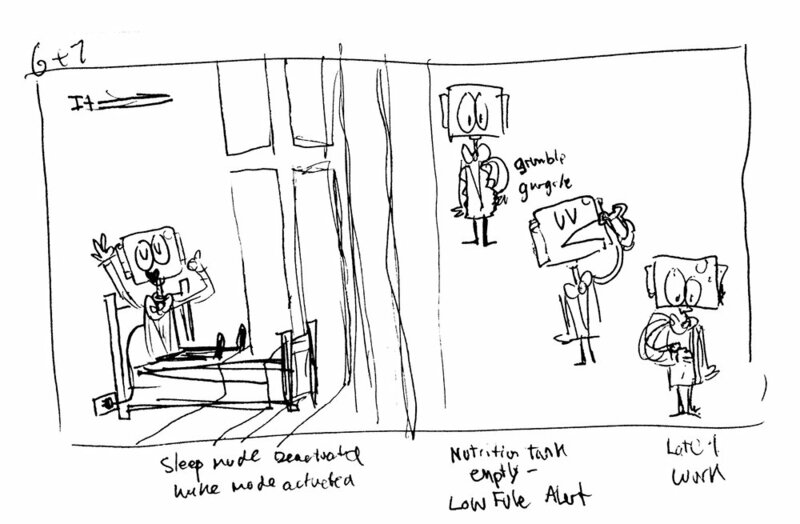 Exactly one day later I emailed my agent some sketches (seen below) to pass onto my editor. I worked everyday for the next month writing, storyboarding and making several book dummies. Below is a progression from sketch to rough dummy to less rough dummy to final art. The story went through seven drafts during the development stage, and it changed quite a bit. There were many pages that I ended up throwing out. For example, originally the viewer got to see a little bit of Robot’s house. Robot also had an office job at some point, but that idea was dropped pretty early in development. There was also a strange sub-plot dealing with a blender. I really liked it, but it was just too much. After two months of long 10-12 hour workdays and a few late nights, the book was done. I turned in the finals on November 21st, 2017. Flash forward to December 24th, 2018, Robot in Love was a real book available in stores. Having Robot in Love out in the world is really a dream come true. Thank you so much to everyone who helped bring this project to life. Robot in Love is available for purchase online here or wherever books are sold. I designed some Robot stickers and pins to celebrate the launch of the book! I also designed some free Robot coloring pages and printable Valentines that you can cut out and share with friends! Get Coloring Pages here! Get printable Valentines here!